← Microsoft MVP Conference – #mvpconf Quer ganhar um ingresso? 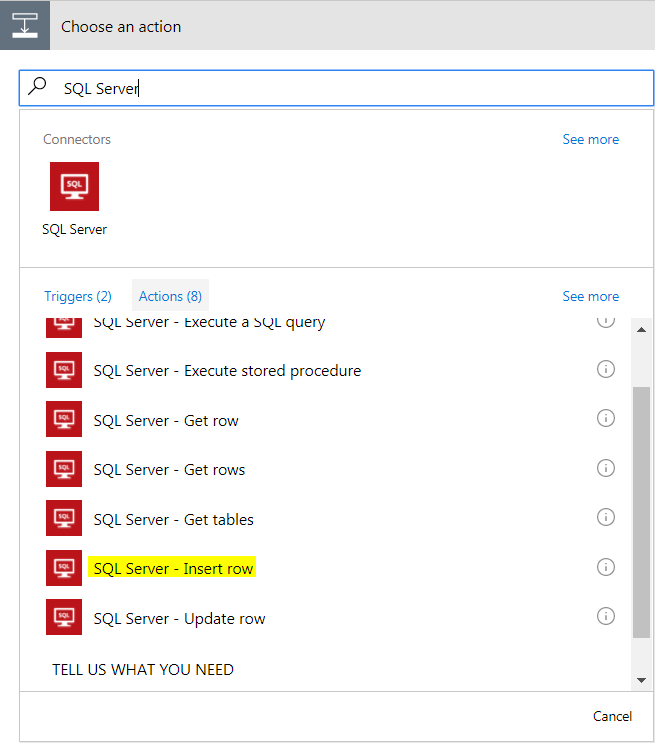 Coming back to what I wanted to write about, I want to connect Microsoft Flow with SQL Server where the results will be stored in a table where you can later query it. Let’s go to action. The first thing that you have to do is login to your Flow account and click on My flows as shown in the below picture. You have the option to use pre-created workflows and just do some small modifications to your own purposes, but in this example I am using the option to create from blank. What I want to do is to every new tweet that I post, I want to save in a SQL Server Database an do some post analysis later. So, based in the below screen I select the option to use the twitter connector. 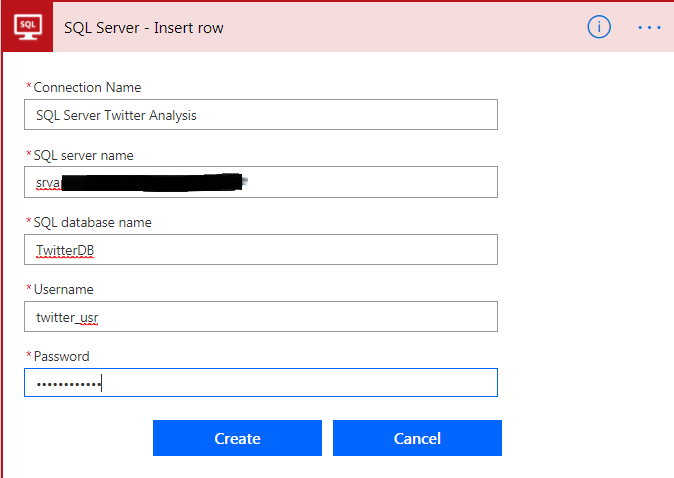 I’ve already created the connection with my twitter account and I want to track every tweet that I do using the #sqlserver hashtag. Because my workflow is simple, I will just add an action, which is calling SQL Server to insert the tweet that I just created. The next step is creating a connection. Here, you can specify an Azure SQL Database or a SQL Server Database Server that has a public IP. PS: You can also use the a Data Gateway, but I didn’t test yet, so I don’t know what is the behavior. Right after the connection is created, you have to specify the table that it is going to store the tweet details. After the table is selected, the schema is mapped and you can see all columns that you have fill up with data coming from the previous connector. Then, all that you have to do is relating the tweet columns with the table columns like the screen below. After those steps are completed, you can save and then click in Done as shown. Because I am monitoring a particular hashtag it might take some time before you start seeing data. I may say that I am enjoying playing around with Microsoft Flow. It brings a lot of cool benefits, specially for those who doesn’t have code skills. 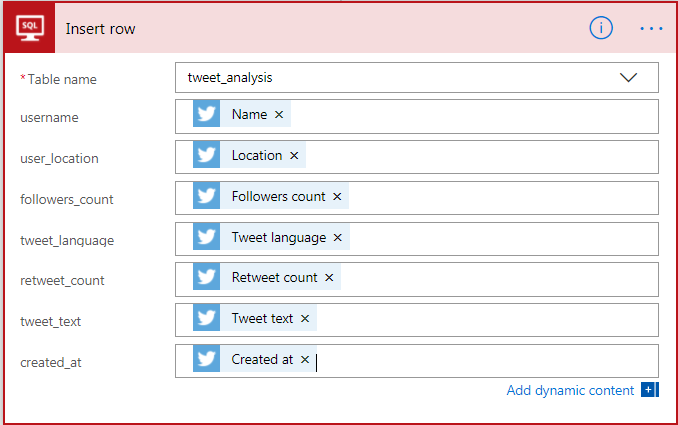 Posted on April 3, 2018, in Dicas, Microsoft Flow, VirtualPass and tagged Free Microsoft Flow + Twitter + SQL Server, how to save tweets in sql server, Microsoft Flow, SQL Server, Store twitter data in SQL Server, Twitter Analysis, using microsoft flow and sql server. Bookmark the permalink. 1 Comment. I”m doing the same but with SharePoint List 🙂 much more easy.